Originally, I was going to make a wrist wallet for my daughter who doesn't always like to carry her purse or wear something with pockets if she's just going to the convenience store. The idea didn't work out as planned so a few rows in, I decided "bangle bracelet". That's the one on the bottom. She loved the bangle and has worn it every day since I finished it. Really easy to make, and I think I'm going to try a beaded variation soon. fpdc= front post double crochet, yarn over, insert your hook around the post of the dc on the previous row from the front, finish double crochet as usual. bpdc= back post double crochet, yarn over, insert your hook around the post of the dc on the previous row from the back, finish double crochet as usual. After the first row of fpdc and bpdc all the fpdcs and bpdcs are worked on the previous row of them which forms the ribbing. It's a very simple technique if you haven't tried it before. As shown, the finished bracelets have a 3 inch inner diameter. Chain 30 loosely and join chain with a slip stitch being careful not to twist the chain. For different sizes, a multiple of 6 for the top bracelet, a multiple of 2 for the bottom. Round 1-5: Ch 1(does not count as first stitch), sc in each stitch around, sl st to join. Round 6: ch 2 (counts as first dc), dc in back loop of each stitch around. Sl st to join. Round 7: ch 2 (counts as first dc), fpdc in next stitch, bpdc in next stitch, alternate fpdc and bpdc all the way around, ending on a fpcd. Sl st to join. Round 8: ch 2 (counts as first dc), fpdc in fpdc of previous round, bpdc in bpdc of previous round. Repeat all the way around ending with a fpdc, sl st to join. Break off yarn leaving a long (at least 14 inches) tail. Fold the tube in half with the single crochet rows on the inside and the ribbing on the outside. Stitch closed all the way around working in the back loops of the ribbed rows and through the beginning chain on the single crochet side. Weave in all ends. Round 7: ch 2 (counts as first dc), bpdc in next 2 stitches, fpdc in next 3 stitches,* bpdc in next 3 stitches, fpdc in next 3 stitches*, repeat ** around ending with 3 fpdc. Sl st to join. Round 8: ch 2 (counts as first dc), bpdc in all bpdcs, fpdc in all fpdcs. Join with sl st.
You can vary the ribbing counts to make different styles. It makes a nice, chunky soft bangle bracelet. 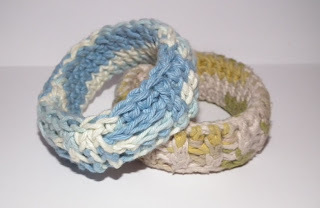 I've made several bracelets using your ribbed crochet pattern, I really love making them and giving them as gifts. I tossed them in the machine and gave them a good stretch (I added an extra row on a few because I love cuffs). Thanks for the pattern! This is beautiful and so simple at the same time! Now that I know how they work up I am going to add beads to it! Thanks for the pattern!